It's been a long time coming, but we finally released our ShipStation integration. If you don't know what ShipStation is, it's the best way to manage sales from multiple sources. For instance, if you have products on eBay, Amazon, and Limited Run, ShipStation's will allow you to see all the orders from those sources, in a single dashboard. They also work with packing and postage companies like Endicia, so you can immediately get the package ready to ship. We highly suggest checking out ShipStation. Especially if you're running stores on multiple platforms. If you have any specific questions, please get in touch. Thanks Everyone. It’s been nearly 3 years since we released SoundScan reporting, and during those 3 years we’ve reported a whole bunch of amazing releases. A ton of which were Top 200 releases (humble brag). But even though we have so many people using our SoundScan app, and reporting to SoundScan on a daily basis, we still have a lot of people that don’t. This is why we wanted to lay out a comprehensive way to do this. It costs very little, and with our automatic app, it’s incredibly easy to do. We should probably explain what SoundScan is and how it works, before we dive straight into the weeds. SoundScan is the music sales arm of Nielsen. Nielsen, of course, is a global information and sales tracking company. It’s almost like analytics for product sales. But SoundScan can only track the sales of your release, if you tell them what it is. This is where UPC and ISRC codes, come into play. ISRC = International Standard Recording Code. The first thing you must do, if you want to report your sales to SoundScan, is get a code. If you want to report a digital and/or physical album, you need a UPC. You can get this code from a number of different places. The best place is whoever you’re using to get your physical release manufactured from. But there’s a million other places too, just do a Google search. After you obtain the UPC, you still need to tell SoundScan you have it. This is where a lot of confusion starts to take place. Many people don’t realize you need to register that code with SoundScan. Or sometimes they forget. If you don't do that, they will have no idea that you're releasing an album. Here's the kicker: We don't know that you didn't register it, so we're going to report it anyway. That makes for a very exciting investigation. The code must be registered at least 2 weeks prior to the release date of the album. You can register the code here. More confusion happens when SoundScans rules for reporting aren’t followed. For instance, you can’t sell an album for less than $3.49. I think you can understand why. Lets say you put your album out for $0.01, and then offered free shipping. You’re probably going to sell a lot more than if you sold them for $3.49 + Shipping. Not many artists could subsidize a release like that, so it’s against SoundScan’s policy to do so. Another important point about this. $3.49 counts discounts. Meaning, you can’t sell an album for $10, and then give out a $9 discount code, and then report those sales to SoundScan. They won’t be counted. Want to hear about even more confusion? We get a lot of emails from people saying they sold X amount of copies of their new album, but when they received the email from us stating how many of those sales were reported to SoundScan, the amount was significantly less. The reason it’s less is SoundScan only counts sales taking place in the US. Meaning if you sell a copy to someone in Germany, it won’t be reported. Please remember this before you freak out. Lastly, we want to link you to our help doc on how to report using Limited Run. If you follow our doc, you shouldn’t have an issue. But if you do have an issue, please contact us and we’ll point you in the right direction. 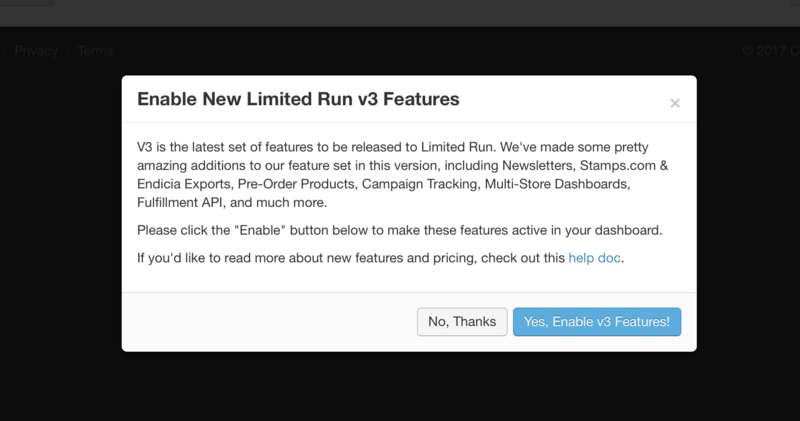 As many have probably noticed, v3 is available and if you head into your dashboard, you'll see an overlay that asks you if you want to enable it. Thanks for everyone's patience this year. We know it took a while for this to come out, but we didn't want to put anything out there, that wasn't ready. We tested everything extensively, with a whole ton of stores. If someone thought a feature didn't feel right, we went back and changed it. If someone thought a feature didn't work right, we went back and fixed it. We were on a mission to make v3 features perfect. We have some more great features coming to v3 this year. Maybe even as soon as next week. This week we have a nice feature to announce. Well, it's not really a feature, it's a theme! Our friend Andrej Presern whipped up a whopper of a theme for us, and we're super happy to make it available to anyone on v3. It's a slick theme that's going to be a great addition to our arsenal. The next time you hear from us, we're going to announce the launch of v3. We've been working hard to get this ready for everyone, and we hope that when it's availabe, everyone switches and loves it, just as much as we do. Last week we explained more about the Fulfillment Dashboard, and how it's going to make life for people running more than one store, a whole ton easier. This week, we're going to try and help out companies that have their own in house shipping and warehousing software. We call it the Fulfillment API. This is a simple enough feature to explain. Basically we wanted a way for companies that run their own warehousing and shipping software, to still be able to use Limited Run as their online store platform, but not have to export using the dashboard. This is where the Fulfillment API idea came from. It will allow you to pull unshipped orders, without having to go into the dashboard at all. Even the Fulfillment Dashboard. There's something else it does too. It will allow you to change inventory levels for stock requests or issues with inventory. For instance, lets say a client contacts you and asks if you can send them 3 shirts. Instead of going into the dashboard and searching for the product, then editing the inventory manually, you can do it right through your own warehousing software, that's connected to Limited Run through the Fulfillment API. Another good example is lets say you find some damaged goods, or even worse, you don't find the goods at all! This is an unfortunate reality when dealing with physical goods. Sometimes they just "disappear". Hopefully this helps you manage issues like this, a little easier. © 2017 Cloud Warmer, Inc.